The music of Rachmaninov has found a passionate advocate with the pianist Leon McCawley in these thrilling performances. This album starts with the renowned C-sharp minor prelude, op 3 no 2. The hammer blows which announce the work are one of the most instantly recognisable openings in all classical music and McCawley makes you sit up with a bold but measured account of this perennial favourite. He also wisely avoids the temptation to wallow in the sound which would otherwise make the music sound like a slog. McCawley navigates the technical and interpretive demands of the op 23 preludes with great aplomb and some of his accounts stand out. He gives a barnstorming performance of the defiant second prelude which in his hands sounds like an extended, exuberant fanfare. The famous fifth prelude bristles with a spiky military pomp and contains a beautifully measured central section with hushed, rippling arpeggios and an exquisite, unhurried interplay of voices. The meandering left hand in the sixth prelude is quite hypnotic against a rather severe melody in the right hand (we are clearly here in the territory of his piano concertos). And among the preludes which most resemble studies, the brooding seventh prelude contains rapid, delicate and crystalline finger work which builds to a breathtaking climax. In the harmonically more daring op 32 set there is plenty to admire. I particularly liked McCawley’s bravura performance of the programmatic fourth prelude in which a Beethovenian military scherzo builds to a phenomenal climax. Was Rachmaninov trying to outdo Alkan with those crashing, full-fisted chords? No matter, McCawley sails through the piece. Equally compelling is his account of the great tenth prelude in B minor, a sombre work in which McCawley brings out the full sonorities of the piano in a sustained peroration of great power. And if that wasn’t enough, for the final hymn-like prelude, in which Rachmaninov seems to recapitulate what has gone before, McCawley rounds off the album with blistering display of virtuosity, leaving you aching for more. Bravo! The performances are matched with a fine recorded sound and the album contains informative notes on the music. Pianistically and musically, McCawley sails through these Russian works way ahead of many of his contemporaries…even with modern recordings by Shelley, Osborne and Ashkenazy, McCawley is among the top recommendations. He thunders through the stormy opus 23 no 2 and can then create real pianissimo intensity in the lesser-known opus 32 Preludes the Russian pianists normally reserve for themselves. This is a classic, unsentimental and in the best sense of the word, straightforward, Rachmaninov recording that listeners surely will want in their collection. Leon McCawley admires Rachmaninov’s clarity, transparency and avoidance of sentimentality all of which qualities are apparent in his playing here. In the Op. 23 No.5 McCawley gives the opening stamping rhythmic figure real swagger, while gently coaxing the lyrical central section and the twilit romanticism Op. 32 No.10 is tender but never cloying. The evergreen early Prelude Op. 3 No. 2 in C sharp minor is paced quickly but still powerfully. It’s an excellent set to rival those of Ashkenazy (Decca) and Osborne (Hyperion). 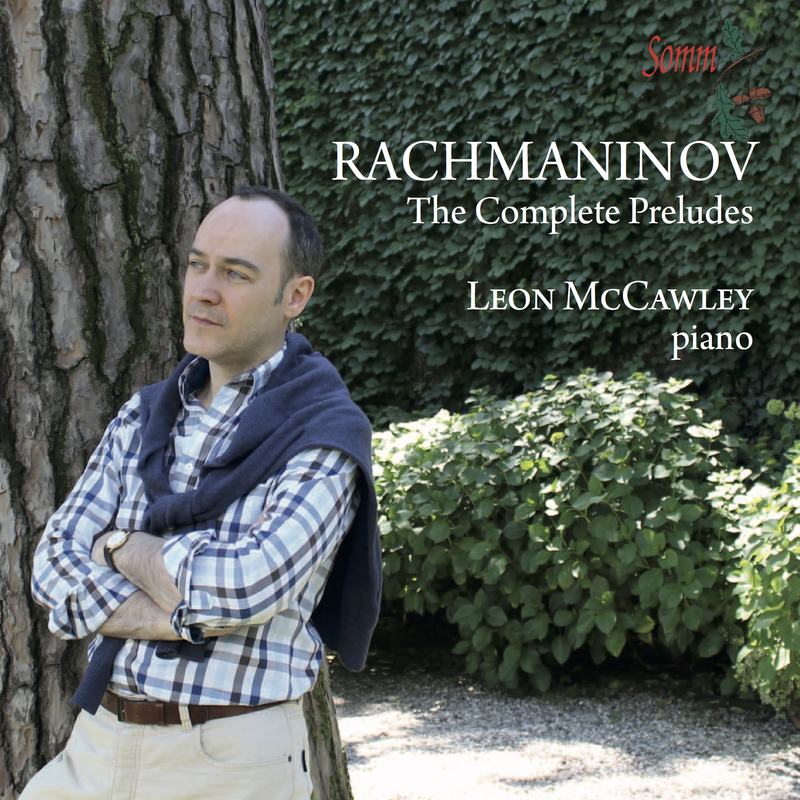 The international prize-winning pianist, Leon McCawley has given us – via the recording facilities of Somm Records – one of the finest interpretations of Rachmaninov anyone could wish for; making the listener feel as though the Preludes were a single sequence, written at one time – such is the integrity and cohesion of McCawley’s interpretive vision and dedication. It could be said that the over-exposure of Rachmaninov’s Second Piano Concerto, or his Rhapsody on a Theme of Paganini, has taken us away from the “pure” essence of the composer – something which the Preludes seem to embody and exude. Perhaps, as a result of the achievement of Leon McCawley, audiences and CD buyers may be able to see another facet of a figure with whom we thought we were familiar. …Leon McCawley finds a delicate emotional fervour with no lack of drama in Rachmaninov’s 24 Preludes, aligning himself with other celebrated performances on disc by Moura Lympany, Howard Shelley, Steven Osborne and Ashkenazy. With Op. 3 No. 2 [there is] an imperious response to the over-familiar. An unusually rapid tempo for Op. 23 No. 1 never masks a haunting sense of its melancholy climbing, and there is a defiant touch at the end. McCawley is crisp and characterful in No. 5 and is no less attuned to the starry emotion of No. 6 or the capricious arabesques of the delectable No. 8. In the still richer fields of Op. 32, McCawley sweeps aside the stale notion that Rachmaninov was a conservative (think of the wild and whirling No. 6). He sounds grateful for the startling burst of gaiety in No. 2, is scrupulously sensitive to No. 10 in B minor and ends with a broad and dignified rather than hysterical performance of the magisterial No. 13. Somm’s sound is entirely equal to the occasion. and this is distinguished issue. McCawley opens his new disc with Rachmaninov’s most famous prelude, the Prelude No. 2 in C sharp minor, Op. 3 from 5 Morceaux de fantasie (1892). After drawing our immediate attention in the opening bars, he brings a beautifully poised performance with great care of tempi and is not afraid to let go with some truly wonderful playing in the fast, rhythmic, virtuosic passages bringing a fine sense of scale. With the Preludes, Op.23, all but one of which were composed in 1903, McCawley brings a lovely sense of forward pushing tension to No. 1 in F sharp minor, a subtle racketing up of the drama together with the loveliest of quieter, poetic moments. The stormy Prelude No. 2 in B flat major brings some particularly fine, beautifully phrased and articulated playing as well as a meltingly lovely central section. McCawley’s touch is particularly silken towards the coda with a fine subtle rhythmic spring to the music. He gives us a nicely sprung Prelude No. 3 in D minor played with moments of fine restraint with some beautifully shaped passages before an exquisitely drawn No. 4 in D major with so many shades of subtle colouring as McCawley slowly reveals Rachmaninov’s lovely theme. His phrasing and gentle, subtle rubato are very fine with, towards the end, another meltingly beautiful moment exquisitely played. McCawley’s fine rhythmic playing is to the fore in No. 5 in G minor (1901) with moments of fine bravura whilst revealing the many subtleties, particularly in the second subject, beautifully and sensitivity done with a lovely restraint. There is a beautifully expansive No. 6 in E flat major which has an intimate quality, as though the composer is speaking quietly to an intimate gathering; quite lovely. McCawley’s ability to reveal the gentle subtleties in Rachmaninov’s music can be heard in No. 7 in C minor, again beautifully coloured and phrased with this pianist’s lovely subtle rubato and a finely controlled climax centrally. No. 8 in A flat major receives a sparkling, crisp and rhythmically bubbling performance, beautifully articulated with this pianist’s ability to suddenly reveal some of this composer’s most beautifully turned phrases. This pianist finds so much in the odd little Prelude No. 9 in E flat minor allowing it to have a natural flow right through the climax to its fine coda. McCawley’s performance of the Prelude No. 10 in G flat major makes a glorious conclusion to this set, again finely phrased, with a natural ebb and flow picking up on so many lovely subtle moments. Rachmaninov’s Preludes, Op.32 date from 1910. Leon McCawley finds all the subtle mood changes of the Prelude No. 1 in C major whilst bringing a lively gentle rhythmic quality to No. 2 in B flat major with more fine subtleties, rising through some fine passages before a lovely coda. McCawley’s superb control of dynamics brings much to No. 3 in E major, bringing a joy and occasionally a hint of Russian bells. No. 4 in E minor is beautifully phrased allowing the music to breathe with carefully wrought dynamics as well as a lovely reflective passage where McCawley finds so much poetry and imagination. There is a terrific climax before the fine coda. This pianist’s lovely delicate touch brings fine rippling phrases to No. 5 in G major again with such poetic sensibility, quite exquisite, before the simple little coda. There is a wonderfully controlled Prelude No. 6 in F minor before a beautifully judged Prelude No. 7 in F major where McCawley reveals the lovely little rhythmic pulse that runs through this piece, with so many fine subtleties. Prelude No. 8 in A minor brings some phenomenally fine playing of great intricacy and fluency, once again beautifully controlled and phrased. Prelude No. 9 in A major has a lovely expansive flow, very fine rubato and a fine poetic vision, another exquisite performance whilst No. 10 in B minor, one of Rachmaninov’s loveliest preludes, is beautifully presented with superb phrasing, and a real poetic vision. It rises full of authority and stature before falling back to lead gently through moments of subtly nuanced emotion with McCawley’s timing perfectly judged, particularly in those little pauses. There is more fine playing in the Prelude No. 11 in B major, wonderfully paced, bringing out all of Rachmaninov’s fleeting melodic invention. No. 12 in G sharp minor has such a light shimmering touch, finely controlled with exquisite rubato and a delightful coda whereas the final Prelude, No. 13 in D flat major, opens with a melancholy eloquence with McCawley’s perfectly judged tempo, subtly allowing Rachmaninov’s little theme to take off, rising to an especially fine, broad, dynamic passage before leading through the most lovely of phrases to a very fine coda. Leon McCawley is a real poet of the keyboard in these performances that are alive to Rachmaninov’s wonderful melodic invention. He receives an excellent recording made at Champs Hill, Pulborough, West Sussex, England with a fine sense of space and detail. There are particularly good booklet notes from Robert Matthew-Walker. Anyone wishing to acquire a recording of Rachmaninov complete preludes is spoilt for choice with so many fine recordings available. Anyone choosing this new release can be sure that it is amongst the finest.